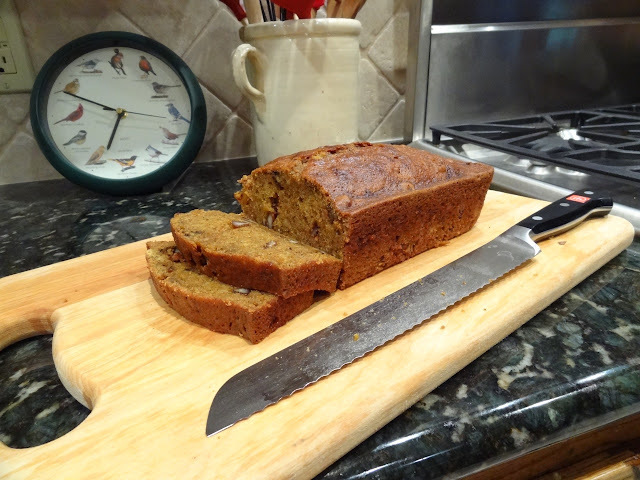 Tis the season for some pumpkin bread! Halloween is just around the corner, and today I pulled out my fall wreath, pumpkins and gourds to decorate. I also bought myself some candy corn, my favorite candy of all time. My mom made this recipe for pumpkin bread last weekend and gave me a half of a loaf to enjoy. By Wednesday, I had finished it, and was already craving more. As I said earlier, decorating put me in a festive mood, so I decided to make this pumpkin bread recipe again. Instead of making two 9 x 5-inch loaves, I baked the bread into 4 mini loaves, and had leftover batter to make 8 standard-size muffins. (This recipe makes a lot of bread, so I recommend either halving the recipe, making mini loaves or muffins to pass out to family and/or friends, or freezing the extras. 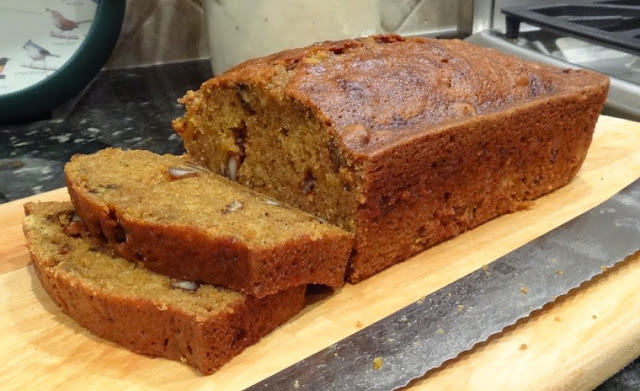 As far as taste, this is my favorite pumpkin bread recipe. I think this homemade version tastes better than Central Market’s and Williams-Sonoma’s pumpkin bread, which are both very good. Our version is extremely moist (it does not dry out), has 4 flavorful spices of cinnamon, nutmeg, cloves, and allspice, and the toasted pecans add a nice crunch. The recipe calls for a pecan streusel topping, but to save calories, we omitted it. I encourage you to try the streusel topping and let me know what you think. It sounds delicious! I know that pumpkin is very nutritious for you, but I’m not sure I’d call this bread “healthy”. Our pumpkin bread has 3 cups of sugar and 1 cup of vegetable oil (however, the recipe makes 2 loaves, which probably serves 32). In addition, the streusel topping contains 1/2 a stick of butter. Quick breads are so easy to make and are one of my favorite mid-morning or late-afternoon snacks. Don’t forget to spread a large dollop of pumpkin butter on your pumpkin bread. A perfect complement, and unlike the name, this “butter” has 0 grams of fat and is only 35 calories per serving! Much healthier than adding cream cheese icing to the top…I’ll save the icing for cupcakes instead! Don’t forget to toast the pecans, they taste ten times better, are more aromatic, and are crunchier. Enjoy and let me know what you think! 1. Preheat the oven to 350 degrees F. Arrange pecans on a baking sheet in a single layer and toast them in the oven for 7 to 9 minutes, until golden brown and aromatic. Reserve 1/2 cup of the toasted pecans for the topping. 2. Grease two 9 x 5-inch loaf pans or 36 standard-size muffin cups with butter or cooking spray. 3. Whisk the oil and sugar in a large bowl. Add the eggs, pumpkin and water and whisk until combined. Stir in the flour, baking soda, spices, and salt. Gently stir in 1 cup of the pecan pieces. Pour half of the batter into each loaf pan. For muffins, fill the muffin pans almost to the top with batter. 4. Stir the sugar, butter, cinnamon, and the reserved 1/2 cup of pecan pieces in a medium bowl. Sprinkle the topping liberally over the loaves or the muffins before baking. 5. Bake the loaves for 1 hour, or until toothpick inserted into the center comes out clean. Bake the muffins 30 to 35 minutes. ***Tip: Pumpkin is a nutritional powerhouse on its own, but if you want to increase the health quotient here, substitute a cup of whole wheat pastry flour for 1 cup of the all-purpose flour. 5 Responses to "Eddie’s Autumn Pumpkin Bread with Pecan Streusel Topping"
I can’t make pumpkin bread but I’m trying this today. If it doesn’t turn out, I’m calling Paula. To Anonymous – This bread is so moist, I could mail you a loaf from Texas and it would still be fresh! To Janie – hopefully the bread was a success for you!